I am more than a bit frustrated with LHO particularly in regard to their dividend policy. LHO has announced it will reduce the quarterly dividend. Knowing that a REIT has to pay out most of its earnings, I think LHO wants to husband its cash to (1) prepare for lower earnings or (2) defend further acquisition threats. Should earnings be high enough that they did not distribute the required amount in dividends, LHO reserves the right to pay a special dividend in 2019 to make up the difference. Every year LHO pays out their undistributed earnings in January. I do not think LHO is suggesting this would be a major event; one that would make up for the dividend reduction. This makes me think LHO is worried about earnings. Perhaps I am reading too much into this but I see no confidence in their own plan. As an income investor, I cannot stomach income cuts. I need a strategy to get out of this stock. Should I sell everything right now. I will receive their last $.45 dividend as the stock was ex-dividend on 3/29/18 so I can sell on Monday and still get that dividend. But what about the implications of the PEB buyout offer. It was a weak offer valued at about $29.95 or where LHO stock is trading. Yet this offer could suggest PEB or another company might up the offer and the value of my shares could still go up. Selling now could be foolish. After the dividend reduction, LHO will still yield about 3%. I am getting paid while I further determine if there is upside potential for LHO. I still want to exit this stock. It is one of my rules, get rid of stocks that cut dividends. But, my rules don't say sell the day after the news. My first move will be to place an order to sell a call on Monday. I am aware that these calls are thinly traded and I may not get my price. Call options can dry up quickly. 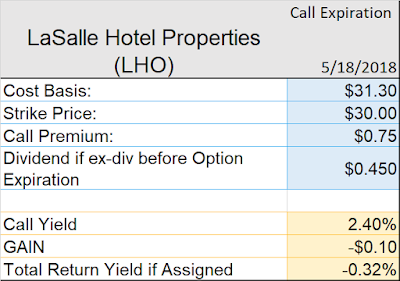 However, if other investors think their is upside potential for LHO, they will create a market in call options for LHO. A lack of options will be a factor in my decision to sell LHO outright. The table below uses trading prices from Thursday, March 30. I selected the $30 strike price carefully. I hope to sell the above call on one half of my position. My basis, adjusted for dividends, on this lot is $31.30. With the call premium, I will basically break even. I can never get back the time value of the money but I will be happy to get out of this position and move it into a dividend growth stock. I will hold the other half of my shares which are at a cost basis $36.65. 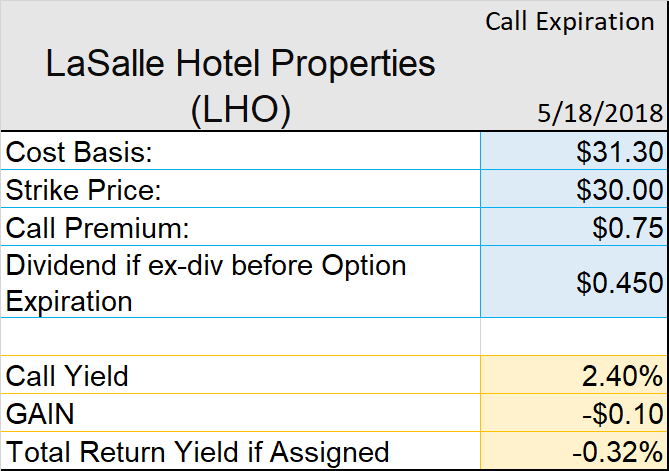 I am hoping there is positive news about acquisition interest in LHO and I can sell a call that will make me whole. I won't wait too long. If the stock price deteriorates, I will sell quickly, lick my wounds and move on. I just hope the price deterioration does not occur during the time I have to hold LHO to keep my call "covered."